Haq's Musings: Jaswant Singh on Indian Foreign Policy's "Strategic Confinement"
Jaswant Singh on Indian Foreign Policy's "Strategic Confinement"
"The principal purpose and objectives of our (India's) foreign policy have been trapped between four lines: the Durand Line,; the McMahon Line; the Line of Control (LoC) and the Line of Actual Control (LAC). To achieve autonomy, an absolute necessity in the conduct of our foreign policy, we have to first find an answer to this strategic confinement". Former Foreign Minister Jaswant Singh of India. Mr. Jaswant Singh's quote above captures the essence of the former Indian Foreign Minister's 2013 book titled "India At Risk: Mistakes, Misconceptions and Misadventures of Security Policy". The book covers nearly seven decades of India's policymakers' obsession with its two nuclear-armed neighbors. "By doing so (agreeing to partition), we then effectively forsook, rather destroyed, the essential security of a united Indian sub-continent, bound by the Himalayas in the north and the east, and the Indian Ocean as a shield to peninsular India. We failed to maintain as physically inviolable our natural geographical boundaries. In consequence, we created great subsequent national security challenges. It is self-evident that because of this one act, this artificial and rather irrational vivisection, we created for ourselves, such fundamental problems as challenge us till today." 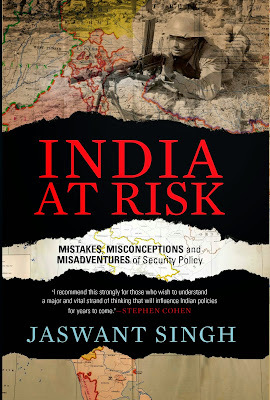 Mr. Singh offers the standard Indian narrative of events ranging from the 1962 war with China (which he blames on Nehru), the 1965 and 1971 wars with Pakistan (for which he holds Pakistan responsible), , Indian and Pakistani nuclear tests in 1998, Kargil conflict in 1999 and the usual narrative of "Pakistan-sponsored terrorism" for precipitating the 2002 India-Pakistan stand-off (and his heroics in averting a war). Among all of these narrations of events by Mr. Singh, there's one real revelation for me: the PNS Ghazi, the Pakistani submarine lost in 1971, was not sunk by the Indian Navy as was claimed at the time; it actually sank as a result of an accidental explosion while it was laying mines to block the Visakhapatnam Harbor in the Indian state of Andhra Pradesh. Why does the Durand Line concern Indian policymakers? Why is the Durand Line brought up by the author but not discussed? Was Mr. Singh told by Indian intelligence agencies remove any discussion of it for fear of exposing their shenanigans along Durand Line? What is India up to in border areas between Afghanistan and Pakistan? Is it using Afghanistan as a "second front against Pakistan" as described by former US Defense Secretary Chuck Hagel? Why is the self-styled Baloch government in exile (whose leaders travel with Indian passports) so vehemently opposed to the Durand Line? Mr. Jasawnt Singh has covered a lot of ground and pointed out the failings of Indian policymakers in looking beyond India's immediate neighborhood, particularly their obsession with Pakistan and China. It also appears that he been to forced by the Indian government to abstain from any discussion of India's proxy war against Pakistan via the Afghan territory. About PNS Ghazi I met an ex Navy personnel and he told me about a year ago when i met him as he had first hand information. He told me the Mines that we had were French Mines and they had 2 kind of switches at which they can be detonated at one position it would activate immediately whereas on the other setting it would activate after the laying ship at is at a safe distance and the unfortunate thing was that it use to come as a default on activating on immediate release and probably this was the reason that one of the mines it layed was the one that detonated and Ghazi was sank. The unfortunate thing is that the gentlemen told me he talked to his commandant about it and he just gave him a shutup call may be due to covering up the reasons and the backlash could have ruined many seniors jobs. The most pressing threat to India’s peace lies on its borders, especially the Himalayan border with China, the world’s longest disputed frontier – not least because uncertainty there facilitates inflows of terrorist forces bent on undermining India’s territorial integrity and sowing seeds of ethnic and religious conflict. While India has fought terrorism longer than any other country, the problem now affects the entire region, including Afghanistan, China, and Pakistan. With Islamist terrorism spilling across its borders, India can no longer leave the turmoil in the Arab world to others to manage. Instead, it must take an active role in efforts to contain and ameliorate it – and that means developing new strategic alliances. Just as terrorists have created a kind of multilateral offensive, the countries that they threaten must construct a multilateral defense. For starters, India should welcome – and foster – the thaw in relations between the US and Iran. Given that both countries are friends of India, and that all three share many strategic interests, a nimble Indian government has an opening to help facilitate a diplomatic rapprochement. Meanwhile, a strategic alliance that supports peace in the Indian and Pacific Ocean region – for example, among India, the US, Japan, South Korea, Australia, and Vietnam – could be shaped quietly and calmly, without impeding any of the partners’ ability to establish economic ties with third parties, including China. India must also work vigorously to renew its relationships in Southeast Asia, where it risks abandoning the field to China. At the same time, India must develop a strategic understanding with China, Russia, and the US concerning the jihadist explosion in Pakistan, Afghanistan, and the Central Asian countries. Such an understanding would, of course, have rough edges, with India, Russia, and China simultaneously competing for influence in Afghanistan. Nonetheless, some sort of accord, whatever its gritty nuances, is both possible and necessary, given that preventing Afghanistan from relapsing into civil war or again becoming an export base for terrorism is in everyone’s interest, including Pakistan’s. India’s next government must also nurture the country’s partnership with the US. Until recently, the bilateral relationship has tended to be guided by a transatlantic, trans-Eurasian perspective, while ignoring the trans-Pacific option. But India, blocked to its west by Pakistan, is increasingly looking east for trade and strategic partnerships. As it explores these possibilities, it can work with the US to shape a common perspective in Central Asia. As for Pakistan, India’s NAM-driven inaction has given its nemesis the upper hand in isolating India strategically. This is extraordinary, given that Pakistan is the region’s principal protector of terrorist forces – and has now, sadly, become the victim of its home-grown militants. America’s withdrawal from Afghanistan will, in the short run, be a setback for the entire region. But, even as the US withdraws its infantry, it cannot ignore the threat that Islamist terror poses to America. That is why the US will increasingly depend on countries like India to ensure the success of its global anti-terror policy. But the value of the bilateral relationship extends far beyond the war on terror. The US and India must also establish clear channels for technology transfer – military, industrial, and scientific, including with regard to space. Any forward movement in US-India cooperation must be characterized by care and respect, with objectives that are unambiguous, practical, and achievable. If both governments devote the necessary time and energy to each other, they can create a partnership between the world’s two largest democracies capable of playing a key stabilizing role in South Asia and beyond. Durand Line is the 2200+ km border between Afghanistan and Pakistan, from Wakhan-GB-Xinjiang Confluence (where Pakistan, Afghanistan and China meet) in the North to Chagai-Nimroz-Zahedan confluence in the South (where Pakistan, Afghanistan and Iran meet). The border was jointly drawn up in the 1890s between the Govt of British India (predecessor of Pakistan) and the Ameer of Afghanistan, according the provisions of the Durand Line Agreement. The Durand Line Agreement was inked between Sir Henry Mortimer Durand (on behalf of British Indian Govt) and Ameer Abdul Rahman (Ameer/King of Afghanistan) on 12 November 1893 at Kabul, Afghanistan. Ever since the independence of Pakistan in 1947, the Afghan govt has time and again announced that it doesn’t recognize the Durand Line as an international border between Pakistan and Afghanistan. For their part, the Afghan side presents several arguments to support their view on the issue. Here we examine each of these arguments critically and on the basis of FACTS. Argument # 1) Durand Line Agreement had a life of 100 years, so it expired in 1993. FACT: This is simply not true. Text of the original ‘Durand Line Agreement’ is attached here. It does not have any clause that makes it time-barred. Argument # 2) Durand Line Agreement was signed by Ameer Abdul Rahman Khan against his will (under duress & British army pressure) and without consulting the other Afghan govt functionaries. Argument # 3) Durand Line Agreement was a ‘short term’ agreement made by Ameer Abdul Rahman with the British govt and it expired with his death in 1901. After death of Ameer Abdul Rahman, his son Ameer Habibullah Khan and British representative Sir Louis Dane reaffirmed the agreement by signing ‘The Treaty of the Mole’ (also known as Dane-Habibullah agreement), on 21 March 1905, at Kabul. After 3rd Anglo-Afghan War, Afghan govt mission led by Interior Minister Ali Ahmad Khan signed the ‘Rawalpindi Agreement’ on 8 August 1919 which reaffirmed the Durand Line Agreement. Incidentally, it was first time that the Afghan Govt (not Ameer in personal capacity) ratified the Durand Line Agreement. Argument # 4) Durand Line Agreement was between British India and Afghanistan. With the division of British India in 1947 (into Pakistan and India), the said agreement also expired. Rights and obligations concerning international border created through an agreement. Point to ponder: Afghanistan’s borders with Central Asia (then Russia), China and Iran were demarcated by the British (not even by Afghans themselves). How come Afghanistan’s Establishment circles (historically led by Tajiks / Uzbeks / Hazaras) only have issue with the Pakistan border (demarcated with Afghan rulers’ consent) and are perfectly okay with all other borders in which Afghans had no say at all? Why does the Afghan Establishment pitch the Pashtun population of Afghanistan against their Pukhtoon counterparts in Pakistan, on such clumsy myths as those deconstructed above? This is a point for Afghanistan’s Pashtuns to ponder. I rest my case.